Democracy in the United States depends upon and expects citizens to be engaged at the national, state and local levels by exercising their right to vote. Your vote supports candidates you believe in and issues you believe will produce outcomes that improve your community and your way of life. Some consider voting a duty. All should consider it a privilege. Many people fought for and made great sacrifices to extend voting rights to all citizens. Residential college students who are U.S. citizens may choose to vote in their hometown or at school in their college town if they have resided there for thirty days and are 18 years of age on or before the day of the next general election. How should I make this decision? Vote where you consider home to be. Vote where the ballot issues matter most to you. Vote where you are involved in the community. Register before the deadline in the state where you intend to vote. The deadline to register in Ohio is October 9, 2018 for the November 6, 2018 election. Voter registration can be submitted anytime, but generally must be received 30 days prior to an election to be eligible to vote in that election. Completed and signed forms can be returned to these offices or mailed to the Board of Elections for Butler County or the Secretary of State's office. You can also register in-person at the Butler County Board of Elections office on Princeton Road. Ohio residents with an Ohio driver's license or state ID can register to vote online. 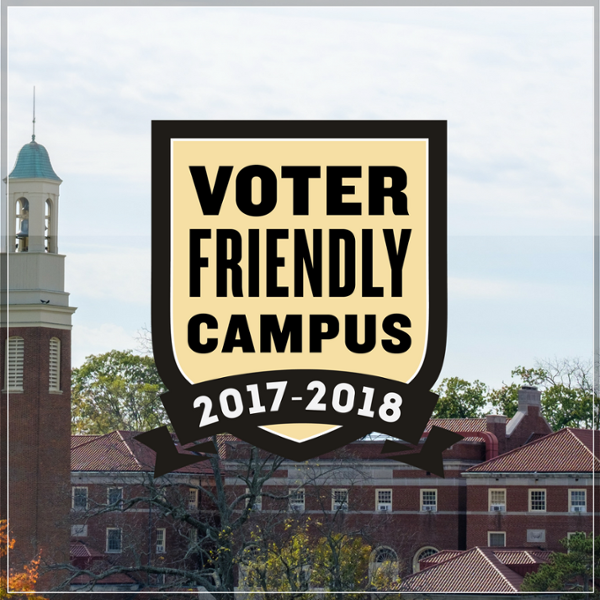 *Please note, if you choose this option, you will be registered to vote at the address that appears on your license or ID (not your residence hall or local Oxford address). This means that you will need to vote in-person in the district associated with your license/ID, unless you arrange in advance to vote via absentee ballot. Information is available on the Vote411 or check the state's Board of Elections/Secretary of State website. Deadlines and processes to register and vote vary state by state. Additionally, opportunities for early voting and absentee ballot use will vary from state to state. Visit the Long Distance Voter website has links to registration, absentee ballot, and early voting information for all of the states. Step 1: Confirm both your registration and polling location on the Butler County Board of Elections website. Voter Proof of Address Letter generated through MyMiami. Under the "Miami Web Page Index (Quick Links)" click on the "V" to get a list of "V" Web Page Links. Next, scroll to the "Voter Proof of Address (for Students)" and click on that link. Select "Local Address" and select "Generate Letter." A current (non-expired) Ohio driver’s license or state ID card with your name and photo. The address on your license does not need to be current. U.S. Military ID with your name and photo (address not required). Unexpired government ID with your name, current address, and photo. Residence Hall Students: If you are registered to vote using your Residence Hall address, your polling location is in the Shriver Center Multipurpose Room on Spring Street (directions). Off-Campus Students: Be sure to check your polling location on the Butler County Board of Elections Website. If you do not have any of the above forms of identification, you may use the last 4 digits of your Social Security # as proof of ID, but you will have to vote using a provisional ballot. Find more information on provisional ballots. In Butler County, you can vote early in person at the Butler County Board of Elections, 1802 Princeton Rd., Hamilton, OH 45011 (directions). You must complete an Application for Absentee Ballot available at the Board of Elections, in order to cast an in-person early ballot. Step 2: When you receive your ballot and identification envelope in the mail, follow the instructions included and return your voted ballot by mail or via the drop box located outside the Board of Elections office. To make sure your absentee ballot is counted, it must be completely filled out and received by the Board of Elections by 7:30pm on Election Day (Tuesday, November 6, 2018) OR be postmarked by the day before Election Day (Monday, November 5, 2018). The USA.gov Register to Vote and Elections website has general information and links to registration, voting, and election information. Election day is Tuesday, November 6, 2018. In Ohio, polls are open from 6:30am to 7:30pm.